② Radical: breakthrough learning that directly challenges the prevailing mental model on which the system is built. A learning organization is an organization which facilitates → vision-driven → learning of all its members and continuously → improves and reinvents itself. may be the only → Sustainable Competitive Advantage ." → Knowledge is most productive when it is shared by all. A learning organization is an organization that is continually expanding its capacity to grow and create its greater future. It is continuously learning new ways of doing things and also involved in a continuous process of forgetting obsolete ways of doing things. Learning is the key competency required by any organization that wants to survive and thrive in the new → knowledge economy. Market champions keep asking learning questions, keep learning how to do things → better, and keep spreading that knowledge throughout their organization. Learning provides the catalyst and the intellectual resource to create a sustainable competitive advantage. 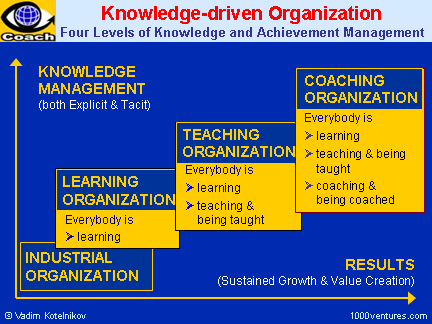 Knowledge organizations obtain competitive advantage from continuous learning, both individual and collective. In organizations with a well established knowledge management system, learning by the people within an organization becomes learning by the organization itself. The changes in people's → attitudes are reflected in changes in the formal and informal rules that govern the organization's behavior and intellectual teamwork. Knowledge communities organized around the principles of → entrepreneurship have the best chance at success. A constructivist learning environment is a place where people can draw upon resources to make sense out of things and construct meaningful → solutions to problems . It emphasizes the importance of meaningful, authentic activities that help the learner to construct understandings and develop skills relevant to solving problems. by taking advantage of unanticipated, unexpected and unsought information.